As of today the Customer formally accepted more than 85% of the work in the new stadium on Krestovsky island. Active works on landscaping of the stadium, site finishing of the hill, construction of access zone pavilions are being in process. The restoration of historical cash and central pavilions is being carried out, finishing of the stadium facade continues. The central square, the central walkway and the small ring road around the stadium are being covered with asphalt. On the field, in the bowl of the stadium, dismantling of the airfield reinforced concrete slabs is completed, on which heavy cranes involved in lifting of roof elements moved. In the first half of June the rails will be completely assembled, on which the roll-out field will move out of the stadium. 18 rail "lines" are placed on a monolithic base, which was installed before. Then, after placing the moulding boards and reinforcement, the space between the rails (with the installation of the intermediate layer) is filled with 2000 cubic meters of concrete. The field is rolled out with electric servo drives and air buffers on the rails to the southern side under the grandstand, which has its supports only on the sides. This became possible due to the unique engineering solution of the builders from St. Petersburg. In fact, the G grandstand, under which the field rolls out, is a big span bridge about 100 meters long. Over 9000 supporting ropes are streched inside it. The construction is designed with high strength and capable of withstanding the unimaginable loads. A place for four SPS (sewage pumping stations) is being prepared in four corners inside the bowl. It is a kind of "wells" put about four meters deep in the basement. These deep wells will be equipped with special containers having integrated pumps inside. As a part of the drainage system they will collect and delete condensate, natural rainfalls and other water, which shouldn't be on the field. The system for moving of the field on the rails will be a technically difficult, and at the same time very precise mechanism. We'll surely tell about it in detail, but in a few words: the field is moved on the rails with electric servo drives. On the sides, to facilitate the work of engines and reduce the loads, the air will be pumped under the field, in other words an air cushion will be created. There will be a laser system along the field on both sides that will record the slightest deviation of the field from its trajectory: if at least one of 394 (!!!) wheels slips while driving, it will immediately, though to a small extent, affect the movement of the whole field. Lasers will note deviations, notify the automatic system which will give an extra load on the other wheels and align the movement of the field. It can be said that our roll-out field will be equipped with one of the most precise and complex ESP (Electronic Stability Program, electronic system of the dynamic stabilization) in the world! Technical sowing of grass on the football field was done last autumn. In the end of May the main sowing of grass will be performed in accordance with agro-technical plan. There will be a test match on the stadium in September, by that time the most important structures will be complete: the roll-out football field and the retractable roof. The indoor premises of the sports area (Sector A) will also be finished, and athletes will be able to test them. After that balancing and commissioning procedures on the stadium will be continued. All construction works on the stadium will be completed in December 2016, in accordance with the state contract. 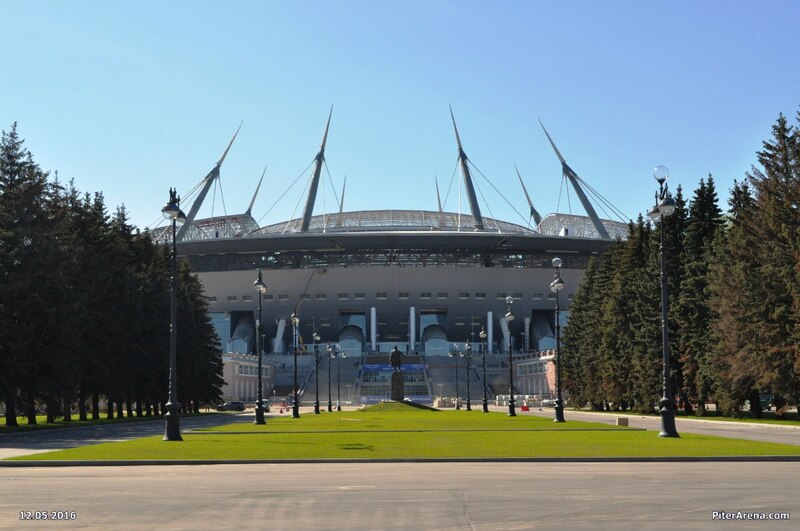 The general contractor of the stadium construction, "Inzhtransstroy-SPB" company is working within the approved schedule.